From the many intriguing accounts we will hear from the members of the original Disclosure Project, those of retired Sergeant Clifford Stone may be some of the most memorable and the most bizarre. Mr. Stone seems to have had experiences which were more unique than any others we have heard about taking place here on the Earth's surface. These accounts quite literally represent the merging of the worlds of the familiar and the completely foreign. We hear from Stone, stories of crash retrieval and of communications with E.T. lifeforms from a perspective of professional expertise. As amazing as these accounts may seem, they seem to represent a world that was considered normal by Mr. Stone and his colleagues. In this episode, we hear further testimonies from Mr. Stone which introduce us to an entirely new paradigm of existence in black operations, and which offer an alternate view of the world around us. As the story continues, we learn of yet more of the true history of our world which has been hidden behind the catered experience of typical society, and reveals the fact that with regard to learning the truth behind the secrecy, we have quite a bit of ground to cover. David Wilcock - Hi there. I’m David Wilcock. 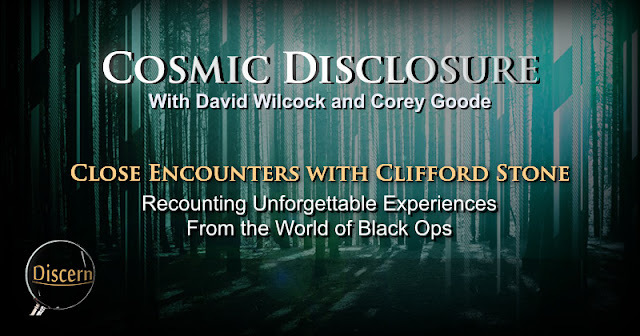 And you’re watching another episode of Cosmic Disclosure with my co-host, Corey Goode. Hey, Corey. How you doing, buddy? Corey Goode - Doing well. Thank you. DW - Alright. Now we are gonna be talking more about Clifford Stone who was recruited by the military because of his empathic abilities and his ability to interface with extraterrestrials. This guy is totally amazing. I hope you’ve seen the previous episodes because these UFO crashes don’t happen all the time. But they do happen. And he is one of the bona fide insiders who’s been out there, I think, about 20 years by now talking about his personal close encounters with crashed extraterrestrial wreckage. Now let’s listen to another one of his fascinating, personal eyewitness accounts. Clifford Stone - The next significant event was that they went ahead and they wanted me to go with them to, once again, Fort Belvoir, Virginia. 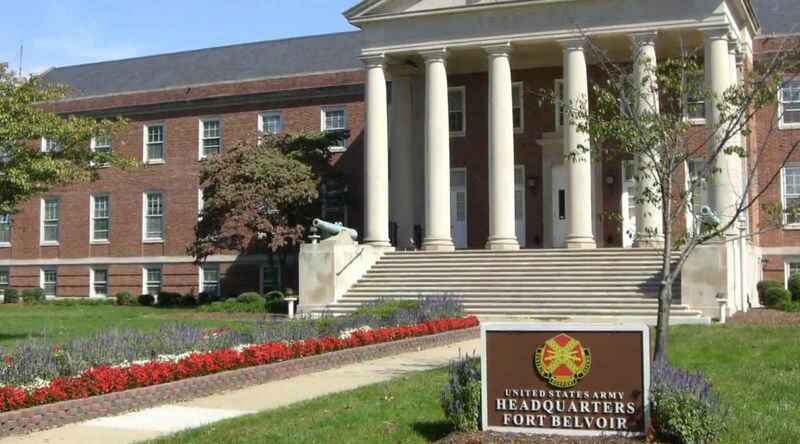 And I know it was Fort Belvoir because they had one of the entities, one of our visitors, that was left behind. And he was being held as a guest at this location in a wooded area. So I went there. And when I got there, he was sitting there. And they had guards all around the place. And as soon as I went in, he looked up at me. And when he looked up at me—you know, no one else could hear what— Just like I say, I can hear it like you and I talking. But I can also feel it. He said, “I am afraid.” And I could feel the fear. And I could also see, you know, his concern about seeing his family again. And I said, “You know, there’s no one gonna hurt you.” But you know, he had that fear. So I went ahead and I said, “Well, what can I do?” He says, “My people are coming to get me. And if they come here, they’re not gonna try to hurt no one. But because of the technology to extract me from inside this building, many of your kind will die and be injured.” And I went ahead and said, “What can I do to avoid that? Should I tell them?” He says, “No, they already know that that is a possibility. The ones that are here that know, know that.” So I went ahead and said, “OK, what can I do?” He says, “Try to help me get outside.” So I went ahead and had a friend of mine bring over some wire cutters and place them out by the fenced-in area because the building had a fence around it. And I went ahead and told the colonel, “Look, he’s got to tell me something. But he says he will not do it because there is a little demonstration that goes along with it while any of the military is in here. I need the building completely cleared. And it’s got to be just him and I.” Reluctantly, the guy I always called the colonel, he cleared them. Once again, this alien was—and I can’t call it a typical Grey. But the skin was a little lighter than a typical Grey. The facial features was about the same. The head was not totally round but, you know, [s-long?] shape is the best way to put it. But he still had a definitive jaw and everything, the large eyes, but it had, like, a yellowish tint to it, if that makes any sense. But you know, when he looked up at me, I thought everything he was feeling. If you missed your child—if you had a person you miss, you gotta understand they missed their family also. It’s the same way. But you feel it from their perspective. And it’s hard to put into words. But you feel it. Then, your own emotions come into play. And at the same time, you know that this low creature is willing to give up its life because it doesn’t want to see us be hurt or destroyed because they’re coming to get him. They cleared the place. And I went ahead and told him to follow me. And we started to go out. Then, as we started to go down the hallway, I started to hear other people yelling, “Halt, halt, halt.” And it got to the point where they were saying halt or we will shoot. So I make him get in front of me. So he’s in front of me. And we get out there. And I go ahead and I clip the fence as quickly and as fast as I could. He goes on out. Then, this craft comes over. And as the craft comes over, it was just like this bright light just shining down on the ground. And like, when it goes off, he’s no longer there. He’s rescued. But I can remember I was waiting to die that night because I heard people locking and loading their weapons. And I figured it’s only a question of time before they are. I’m gonna get shot in the back because they’re gonna identify me as being a traitor. And the colonel was very upset with me. When I called the colonel, he was very upset with me. And he just told me, “The next time, let us know what you’re gonna do.” But I told him, “You know, how do you keep guests under armed guards and call them guests?” And the whole situation is, I will never understand that. He was left behind by his own. We knew of a landing. And we immediately put a pounce operation where we immediately went to the area and was gonna try to extract as much of the useful data we could get, even up to and including the craft, if possible. And I never liked that type of scenario. I never fully understood it because the situation is, were we gonna try to take a craft by force? And they do have the means to defend themselves. But they don’t want to do that. And that was one of the biggest concerns I had was, what happens when we try to do that? But what happens is we come up on a craft, and the visitors already have a rescue ship within the vicinity. Then, we go into what’s called a holding pattern. We don’t approach the ship. And on several occasions, they took their people, and left the craft there intact. So when we got there, we had a craft. The whole craft. But the people wasn’t there. But then again—this is gonna sound crazy—they felt that we were so immature in a galactic sense of the word that we could back-engineer little bits and pieces of it, but we would never, ever be able to back-engineer the whole craft, Well I think we have back-engineered enough to where we have certain technology where we tell people we can’t do things. I have no inside knowledge whether we have bases on the moon or whether we have bases on Mars and Venus. But with that being said, I have no inside knowledge that that officially has occurred and that’s officially happened. I know from the knowledge I have gained, the documentation that’s there for anyone to read, the technology has existed all the way to, at least, the mid-50s, and probably long before that. Let me give you an example. Take a 2016 car. Take it back to 1776. And I have to use 1776 because there’s a little understanding of technology at that time. We will understand how the lights on that car work. We won’t be able to back-engineer them, but we’ll understand how. We will understand how the fuel works. But yet, we are not going to have the technical capability to process oil out of the ground to make gasoline. We are going to be able to understand what plastic that’s involved there, what it’s all about, but we’re never gonna be able to replicate it. So this is where they’re coming from. To be honest, while listening to these accounts, I find myself at a loss for words. Upon hearing the detail and depth within Mr. Stone's experiences, I only find it possible to sit and ponder the profound implications they hold. Not only do we learn from these accounts of the multiplicity of experiences which may have been presented to Corey Goode and other intuitive empaths, but we see the varying degrees of interactions like these which seem to combine the duties of a border patrol officer, a linguistic interpreter , and a sort of interplanetary ambassador. DW - Is that kind of sanitized, Big Brother-type of lingo fairly common when they’re holding someone prisoner? CG - Yeah. If you go somewhere—let’s say you’re delivering a message—and it’s a group that are not friendly with the people you’re bringing a message from, it’s very often for you to be their guest in a room with no “door knobs” while they figure out how they’re gonna respond. DW - Now something that really kind of strikes me almost like the scene in a movie—it’s very cinematic—was this being described to him that there would be some sort of event that would take place that would either hurt or kill many of the people in that base if he were to be extracted with their technology from inside the base. And then, when he did see the extraction, it was some kind of bright beam of white light. I know it’s just speculation. But could you speculate as to what possibly are some of the technologies that might exist that could cause loss of life if someone was extracted from inside a building like that because, you know, we think of Star Trek, like a transport beam, that they can just beam you out from anywhere. And it’s the same thing. CG - And they can do that. I was a little confused about maybe that being was telling him that as a catalyst to get him moving. There could be technology that does that. But the technology I had seen and heard about was not gonna cause damage inside of a building that it wouldn’t cause outside of a building. DW - Well here’s one thing that I’ve wondered about. Could it be possible that this particular group of ETs is using some kind of torsion field beam that would basically be like a matter disruptor so that if you’re in the field of the beam that, perhaps, the molecular bonds loosen up or something? And that could cause, potentially, electrical lines to cross over, and then to set on fire larger areas of the building and cause an explosion or something like that. Are there beam technologies that could lead to those kinds of explosive events, perhaps? CG - What you’re describing about is there are torsion weapons to do that kind of thing. Now I just can’t see how them laying down light to change the being’s molecular structure into that of the light and then pulling the light up, I don’t see how that necessarily is going to cause a large loss of life. Maybe some damage to the building, at most. But then again, this could be a technology that this group used that I haven’t heard of. Or it could have been the being using that as a catalyst to get Sergeant Stone to help him escape. DW - Why do you think the being might want to escape, instead of just being beamed out from inside the building? CG - Well, I don’t know. There could be some sort of shielding in the building. CG - Yeah, it depends. If they put certain types of shielding in the building, it disperses a lot of stuff or makes it hard to see who or what’s inside. DW - Right. So the being might say that it’s gonna hurt people inside to appeal to Clifford’s emotions. When in fact, the being itself might end up going through, like, a meat grinder if it was tried to be beamed out of that field that they’ve created inside that base. CG - Or the beam couldn’t reach him at all. They could not be rescued at all, unless they were brought outside of this—whatever would buffer it. DW - Are you aware of there being such containment fields at these military bases that would disrupt those kinds of technology so they wouldn’t work inside? CG - Yes, but they’re usually somewhat like bunkers. I’ve never heard of a building sitting on top of the ground with barbed wire fence around it shielded in such a manner. But that doesn’t mean that they don’t exist. Once again, I find myself at a loss for words. One thought which does come to mind is that if this transportation device was in fact torsion-based, and the possibility of shielding was the actual issue, this might give us a clue into the nature of the situation. For those familiar with the Wisdom Teachings series, the episodes on torsion physics might come to mind in this case. These waves were found by Dr. Nikolai Kozyrev to be a universal propagation of energy independent of electromagnetic energy. 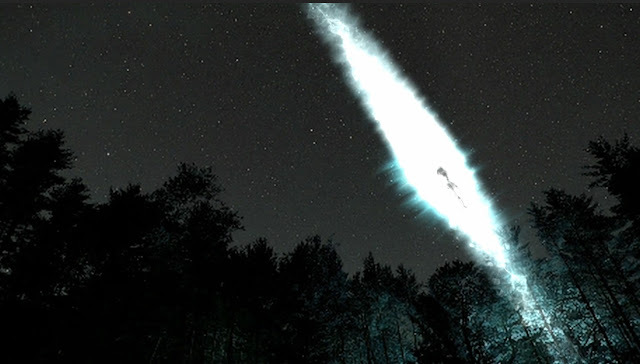 These waves were found to travel faster than light and to be able to penetrate any material with the exception of two. These were aluminum and PVC. For reasons not completely understood by Dr. Kozyrev, these materials effectively blocked the propagation of torsion energy, though when it came to any other material, the waves would pass through no matter how strong or rigid the material was. Given the fact that we do not know the exact nature of the situation, Corey Goode's suggestion does raise a few interesting questions. What was the technology used by these beings to extract their operative off of the surface of the planet? Was it possible to interfere with this technology with any particular material within this building, or was this just a strategic move by this being to ensure his own safe passage off of the planet? Whatever the answer, we may have to wait and see. DW - Right. So there could be some willful deception going on on behalf of the being just to ensure his safe passage where he did deceive in order to be able to get into the safe transport area. DW - There was no real loss of life that might have occurred. CG - That’s a possibility. DW - Right. OK, now when he’s describing the phenology of this being, the description is that it had a paler skin than most Greys. It was whitish. But then, he also described that it had a yellowish hue. Now when we were watching this together and we weren’t filming this, you mentioned something about their diet. CG - Yeah. The different Greys— Their skin would change color if they were not getting the right diet when they were in captivity. CG - I don’t know how long. It didn’t sound like this being was in captivity that long, though. DW - How would the skin change color? CG - It becomes paler, paler, and then, almost white. DW - Wow. And do you know what it is that they’re missing that we can’t give them? What would they eat if they were here? CG - It’s like us suffering from malnutrition. And I don’t know what they eat. I’ve since read things on the internet about them absorbing things into their skin. You know, there were dozens of different types of beings that looked like Greys. So they don’t all have the same biology. DW - OK. Now I guess the other thing we should cover here is his very interesting statements about taking a car from 2016 back to 1776. CG - As long as Benjamin Franklin wasn’t there. You know, he probably could have reverse-engineered a lot of it. DW - How do you feel about the idea that the ETs didn’t think that we’d be able to do very much with their stuff and, therefore, allowed it to come down here? CG - Well by this time, there has already been an ongoing trade with a lot of these different beings. And we had developed technology equal to theirs. DW - But Clifford’s obviously, not on a need-to-know basis for that kind of intel. CG - Right. So you know, one of the things militarily we do if we have a concept, or a secret helicopter, or craft that we can’t extract, we will bomb it. You know, destroy it. With them not destroying the craft left behind, I am speculating that they didn’t see a need to because we’ve already developed, on one level, some of this technology. DW - Do you think that these beings might be, again, trying to steer our evolution and deliberately gift us this stuff so that we’re gonna get to where we need to be faster? CG - It could be. I mean, that definitely occurred. But it would have occurred earlier in history, I believe. DW - OK, now one last thing is that he mentions a pounce team. And that term I’ve seen online in various declassified names of project codes. And I’ve seen a reference to a Project Pounce. I’m wondering if you know anything about that. CG - Just like you, I remember reading that, that it was a program of mainly, I believe, it was Army mainly. But they’ll pull mixed services anytime they can to respond to satellites coming down, secret craft coming down, craft from foreign nations coming down, or unknowns coming down. DW - These pounce teams now have these gigantic, C-5 Galaxy airplanes. And the plane will land at the nearest airfield. And then, there’s all these—they can hold, like, half a million or a million pounds, I guess, of content inside. Then, all these trucks come blasting out of the plane. And they immediately declare a perimeter around the area. CG - That’s a pounce operation. DW - That’s a pounce operation. OK, so now what we’re gonna do is have another really fascinating video for you, this time, of an encounter that Clifford had with UFOs and extraterrestrials in Vietnam. This is very fascinating stuff and gives you even more of a glimpse into the world that Clifford was brought into. CS - Just a couple of months before I went to Vietnam, we had the situation with—they told us that they needed us to go to a foreign country because we had aircraft down and that that craft was a B-52. They had reason to suspect, which now I know it wouldn’t be a reason to suspect. If it had it, they’d know it. But they had reason to expect that there may be nuclear devices on that B-52. Well, I’m getting ahead myself there too because what happened was we were all going to a field training exercise, allegedly. But we were handpicked. It wasn’t the whole unit. They went ahead and we actually drove down to, I think, it was South Carolina. We went to an air base there. We got on a plane, a commercial airliner. And they were supposed to be flying us in to Florida. And Florida was where we were going to have a training exercise. And you know, no one was about to say anything, period. I knew this guy from a couple of other occasions that I was with him. But you know, I didn’t know would he really be willing to shoot somebody or not? But it got as quiet as any—you could have heard a pin drop. 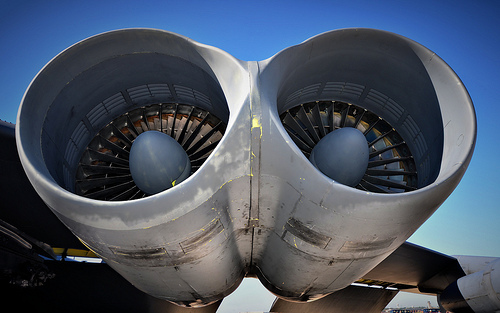 The engines were a loud roar when the plane took off, louder than I’ve ever heard any other jet take off before because it was so silent. Anyhow, we flew and I don’t know—14, 15 hours, 16 hours. And a couple hours before we landed, that’s when they told us, “OK, we’re going into a country in which this B-52 has gone down. The natives there, the people, the populace,” whatever you want to say, “they’re not friendly towards the US government. We have to get in there. Check for survivors. And check to see if there is any danger of any bleed-off from the radioactive material that’s on that craft. And we also have to provide for an extraction.” So we figured, “OK, fine.” So when we land, I remember when we were going in for a landing, it’s dark. It’s night. We looked down. And I remember seeing these fires on the ground. No lights, just fires. But then, when you get to the airport, naturally, you have the red and blue lights and all that. But as we went in, you know, we were still several thousand miles high. And I thought, this is really strange. This is not Florida. You don’t see that kind of thing in Florida. And I’m going ahead and I’m thinking, this is crazy. But we land, and when we land, they go ahead and let us out. And once we get out, I’m sure some people there knew because there were signs there. And they were in Vietnamese. Well, I’d never been to Vietnam. I didn’t know it was Vietnamese. All I knew is we were in a foreign country. For all I know, it could have been a South American country, whatever. I wasn’t putting two and two together yet. And I didn’t see any oriental-looking people there. It was just us. But they went ahead and took us out of the airplane. There were two choppers waiting for us. We got in the two choppers. 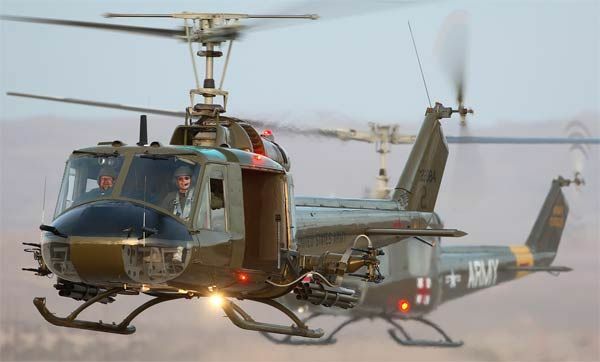 UH-1s. Huey Slicks. And they flew us. And I don’t know how long we flew. It seemed like a couple of hours. But I know for a fact we went to Cambodia. And I’m pretty sure the area of Cambodia we went to is the Parrot’s Beak area. And there was this little stream that flowed by the area where we were let out at. And that was what we were calling our staging area. So from there, we’d go on into the jungle to where the craft went down. And you know, of course, you anticipate seeing smoke. You anticipate seeing debris because, naturally, the craft would have had to been blown all to heck. But when we went in, no one asked for any Geiger counter readings or nothing. But we come up on this clearing. In there in the clearing is this B-52, almost totally intact, except for the damage that was caused to it by natural enemy fire. And I always say I don’t know for a fact because I don’t have no inside knowledge. But I still believe it was surfaced air missiles that hit this aircraft, and probably more than one. The people on the inside had died of the wounds they received as a result of the shrapnel from the hits on the aircraft. We go ahead. We’re looking at this. 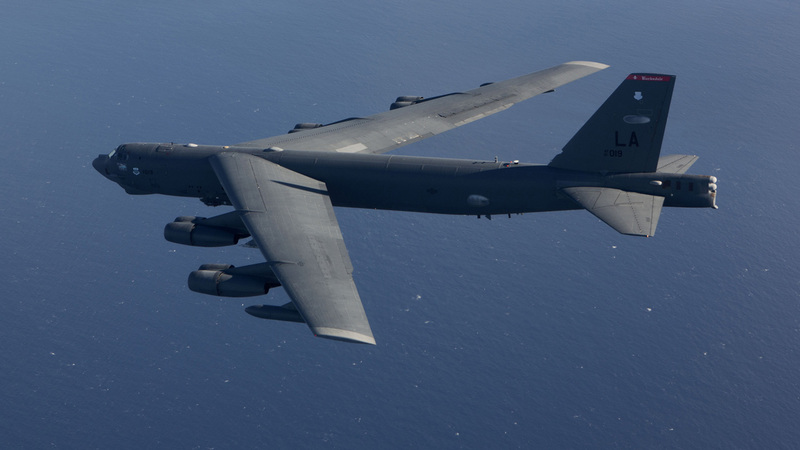 And I always thought a B-52 was much, much bigger. And don’t get me wrong, it wasn’t a small craft. It was a big craft. But I always thought it was much bigger. So I start to walk around it. And I walk around through the tail section. When I get around to the tail section, I go around to the other side. And I hear this, like something in the bush. So I turn around, grab a hold of my M16. I don’t bring it up yet. But I grab a hold of it. Then, I look and this—a typical Grey—and once again, I would have to say about 3, 3 ½, foot tall. Comes out, then several others come out with him. Then, I remember to this day what was said. And it was said, “Clifford, what are you doing here? You are not supposed to be here.” And I remember I still think I may have been the first to fire. I don’t know. But I brought up my M16, fired, and started to yell VC. And you know when you get real humble? When you know you’re hitting something with rounds from that M16, and it’s having no effect. You get real humble because the whole situation is you now realize any other weapon you have on you is useless. And you are now at the mercy of whatever it is you were just trying to shoot. So the whole situation is that we started to fall back. By this time, other people were shooting. Like I said, I may have been the first one to fire. And why did I even say, "VC, VC?" They didn’t tell us we were in Vietnam. They didn’t tell us anything. Only thing is, you know, there was mention made of the little people. I knew what the little people meant. But as we pulled back, we got all the way back to the river crossing. And they followed us to a short distance. But most of the people stopped shooting because I think, within all of our minds, we realized shooting is no good. It’s not going to hurt them. And they’re not really trying to do anything to us yet. And the question is, if they have weapons, they might try to use their weapons. We got across that little crossing. And when we got back there, immediately we were told, well, those were the local natives we saw there. We were thinking, what kind of scam are these guys trying to pull? These entities, no, no, no. They’re not people. They’re not local natives. And I already knew from other experiences. But when we get back there, the guy that I always called the colonel says, “I need a volunteer because we have to go back there.” And I’m looking around. And the other people are like, well, I’m not going. I’m not going. And I darn sure didn’t want to go. But then, I kept thinking and thinking. So I started going one by one. The other soldiers that were there with me grabbed their M16, and they followed suit. They followed me. We got back there. When we got back, we extracted the bodies. We called in to have them lifted out. Then, we were told that there was an engineer team coming in. That they would be going ahead, and I think they called it piecing. I may be calling it wrong. But piecing because they were gonna cut the aircraft up. They cut it into five portions. They cut the tail section off. And then, they had the fuselage. 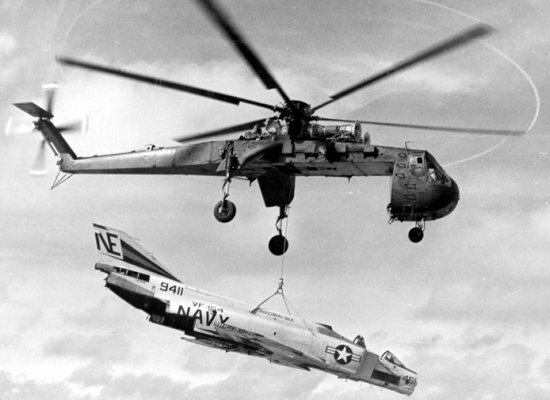 Then, they had what we call CH-54s. "Flying cranes" is what they called them. They came in, and they picked up piece by piece. Then, we went back to the area that we called the staging area. The helicopters came in, picked us up, and flew us back. We got back on the aircraft that we came in on. And we left. And we came back to the United States. Upon hearing this account, there were a number of questions that came to my mind. Why would Sergeant Stone choose to open fire at Greys who were trying to telepathically communicate with him? Why did he shoot as opposed to speaking back to them? I realize that there were a number of factors that contributed to this misunderstanding, but the situation does not make complete sense to me. It seemed that Stone may have put the pieces of this situation together after the fact. However, in the heat of the moment, he may have missed a few details. As he described, he saw these beings, he heard them in his mind, and yet he responded by shouting, “VC!” I can't say for sure why a person would react this way to such a situation, but again, I can understand the reaction. It would be understandable that upon being surprised, Stone might react to protect himself and his team. However, he did hear his name, and given his skills, it may have been more productive to attempt to answer back before opening fire-though this is all from my own second-hand perspective in hindsight. It seems that the role of an intuitive empath may combine that of both a soldier as well as a communicator, and I can imagine that the combination of these roles might be difficult to navigate at time. It is possible that if an area is secure by perimeter and the situation under control, then telepathic interfacing can occur. However, if a situation is unpredictable or out of control, a more military response may apply. Without the knowledge of the actual role, or further details of the situation, it is difficult to say whether I or anyone else might have reacted the same. Either way, this situation seems to go far beyond bizarre. DW - Corey, let’s start with something simple first before we get into the tough stuff. And that is, some people who are skeptically-inclined might say come on. This colonel is gonna frickin’ shoot somebody’s brains out because he questions whether they’re flying to Florida when he says it looks like Oakland, California? Is it true that the military would consider an operation to be so secret that you’re flying somewhere, and if you even try to figure out where you’re going that they will blow your brains out? CG - Yeah. Yeah, they do that to soldiers. They do it to civilian contractors. I mean, that’s SOP. DW - So why would they not want these guys to know where they’re going? CG - Going back to “Loose Lips Sink Ships.” And if they don’t know information, they can’t reveal information. It’s part of the compartmentalization. DW - So if he said that he’s part of this Project Pounce, then keeping it compartmentalized means that he doesn’t have any information that he could leak to any enemies of the United States if he got captured or tortured or something? Is that part of the idea? CG - Or decided to go to the media. DW - Right. OK, so he ends up in Vietnam. 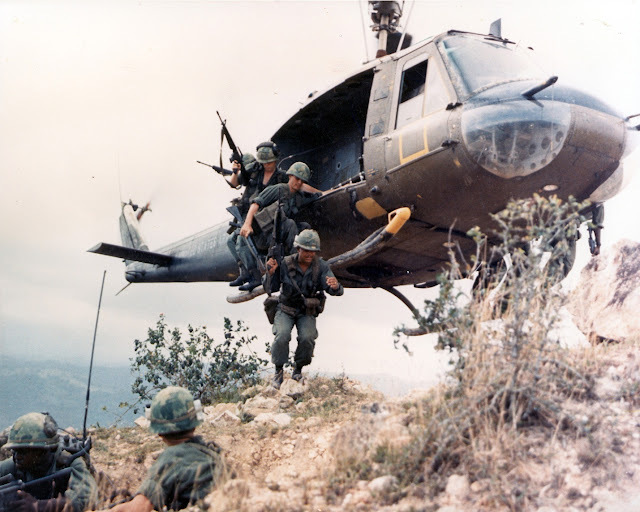 And this is in the theater of war in 1968. Now this is where the thing gets really, really bizarre. He’s going around what appears to be a crashed craft of American manufacture during an active war, in the theater of war, in Vietnam. He goes around the corner, and he sees a group of Greys. And then, the Greys tell him, they call him by name, and they say that he’s not supposed to be there. What the heck is going on here, dude? DW - I guess I’m not really getting to the core of this, which is what the heck are these Greys doing in an American War? Why would they care? Why would they be right near a ship that has just crashed with all these dead people inside? CG - Well, this is a phenomenon that’s gone on in just about every war and skirmish. CG - Yeah. 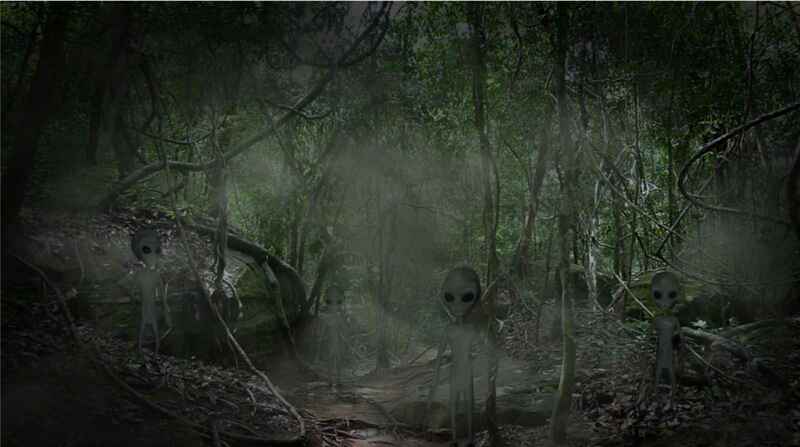 The non-terrestrials that have human beings that they consider assets, they will often protect them. Or if something happens related to them, go and investigate. DW - So you’re saying then that, perhaps, some of the people on the B-52 were high-level assets that these Greys considered vital for them, as well as for America? CG - I’m speculating. 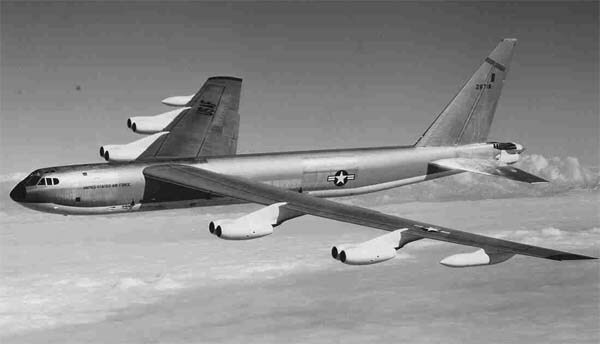 But also, B-52 can carry some interesting things for the few modifications. CG - So they may have had something else inside that B-52. DW - So in other words, there could have been some extraterrestrial material or technology that was on that ship. And it appears to have been shot down by enemy fire. 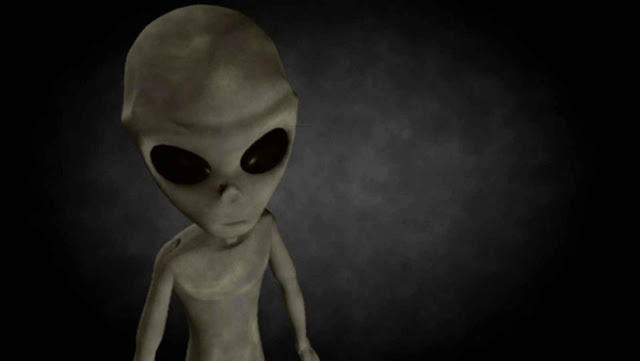 DW - I want to get right to the core of another key question, which is, to your knowledge, has there been direct collusion between entities like the United States and extraterrestrials like Greys to fight a war together like Vietnam? CG - Well, yes. They don’t fight the war with us. But they have agreements with different non-terrestrials on what kind of a role they will play observationally or any other number of possibilities. They have agreements with certain non-terrestrials before they go to war, during war, but they’re not normally fighting with them in the war. DW - Now we’ve heard that both Truman and Eisenhower signed these treaties with Greys, including the TAU-IX Treaty, which apparently was about abductions. Is it possible that part of what these treaties with the Greys would include is that if US government allowed them to abduct a certain amount of American citizens that, in exchange for that, that they might give certain things like logistical support for war efforts? CG - Well, at that time, we really didn’t need their logistical support because we had a lot of this technology developed on our own, even in the late 60s. CG - Technologies for observing the enemy. You know, a higher level of tactical support abilities. Upon hearing this account, I am curious to know just how many species are working with military assets here on the surface. It also makes me curious to know what this bomber had on board that would cause the response we hear about in Clifford Stone's account. Was there some sort of high technology on board, and if so, what might it have been used for? My first guess may have been some sort of shielding technology or some type of protection. However, if that was the case, it did not seem to be completely effective. It may have been for tracking the location of potential enemies, or for simple telemetry of the bomber in flight. On the other hand, there may not have been any foreign technology at all. These beings may have simply been interested in a possible asset who was on board. For what reason, we cannot say, but one thing we can observe is that these beings did not seem interested in interfering in the war so much as they were in observing it. DW - So if the treaty has been signed, why do you think these ETs would care at all about what’s happening to us in a war? I’m still trying to get to the core of what might be going on there. CG - Well, I don’t think we’re ever gonna know what was going on there. All we’re gonna do is be able to throw out a lot of speculation. There’s any number of reasons why they were on-scene there. The reasons I just described to you are just a few. DW - OK, another thing that I think everybody’s gonna want your take on before we end this episode is, how do you shoot at beings with M16s and not hit them? What the heck was going on there? They didn’t seem to have the slightest concern about those weapons. CG - The common-era weapons that we have or the era of weapons that we have, kinetic weapons, even high-energy weapons, they have defenses against. DW - Now you also mentioned that Project Pounce also takes care of broken arrow. DW - Would you explain for our viewers what that is? CG - Well, a broken arrow situation is when a nuclear weapon has either crashed or we’ve lost it in some sort of an incident. A broken arrow means a nuclear weapon or device that is no longer in our possession. CG - That’s right up there. The highest thing, the quickest thing, that they’ll respond to, as well. If these special access groups are told we have a broken arrow situation, they are in the plane, and they are out there immediately. And you have the veil of secrecy that comes along with that situation. DW - Alright. Well thank you, Corey. And I thank you for watching. This is really fascinating stuff. And we are bringing you the cutting edge of Cosmic Disclosure here on Gaia. Thanks again for watching, and we’ll see you next time. Aside from the above commentary, I am at a loss for words. If I do have anything to offer, it would be more questions than answers. How many different types of beings did Sergeant Stone encounter during his tour? Is he still in contact with any of these beings? Do any beings stop by and pay him a visit as they did when he was younger? These stories and others tend to make me curious to know what the retirement is like for an individual after having such an other-worldly experience within black ops and the Armed forces. From last week's episode, David Wilcock mentioned that Clifford Stone's son may have been killed as a result of Stone coming forward with his testimony. Both this as well as many other factors tend to reveal the nature of the program for which he worked. It does not seem that such a term of service would be very preferable to many of us. Considering what we have heard from others such as Corey Goode, this program can present some of the harshest and most uncomfortable situations a person might have, and even though they may think the experience astounding, the aftereffects seem to counteract any previously enjoyable experiences. Either way, it seems as though we as a planet have much to learn beyond that which we have been allowed to know by corporate media. 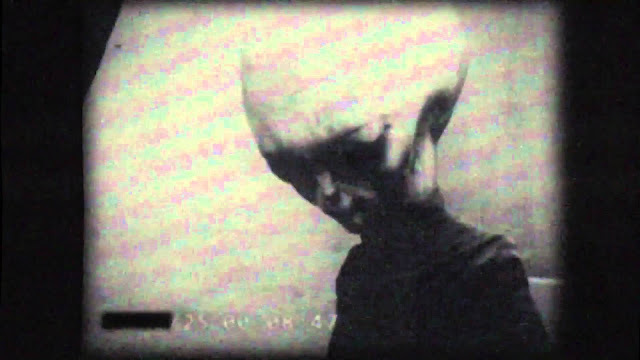 These accounts provide us a glimpse of the entire story behind the global secrecy of E.T life. They help us look forward to the day when we can freely and openly learn about all that has been taking place around us for decades now. We would then be able to know and to interact with other races in a peaceful and productive way free from the violent and self-interested influence of the Military-Industrial Complex, and accompanied by an agreement of mutual safety and benefit for all parties both here on the surface and elsewhere.